It added that it was considering ways it could spend money on supporting the economy and credit markets. Analysts said that the key rate is now virtually zero. "Whether it's zero or 0.25% actually does not make a huge difference," said Holger Schmieding at Bank of America. He added that the more important factor is what policymakers plan to do now that they cannot cut interest rates any further. The Federal Reserve is already injecting billions of dollars into the banking system as well as buying debt based on home loans. The Federal Reserve stressed that it was already planning to buy large quantities of additional debt based on mortgages and is considering whether it would be a good idea to buy long-term US government bonds. The strategy of a central bank buying government bonds mirrors the so-called quantitative easing carried out by the Japanese government when it was fighting deflation in the late 1990s and early 2000s. Deflation becomes more of a risk as interest rates approach zero. It is a serious problem for an economy because people postpone making any large purchases as they believe prices are going to fall, which stifles economic activity even further. Quantitative easing is, "just another word for the central bank injecting so much money into the system that a good deal of it is passed onto households and businesses at a reasonably low interest rate," Mr Schmieding explained. The rate has been cut drastically by the Federal Reserve from the 5.25% where it stood in September 2007. It is the lowest the central bank's key rate - the target rate for banks to charge to lend to each other overnight - has been since records began in 1954. The decision received a lukewarm initial reception from the stock market, with the Dow Jones Industrial Average rising from 8,684 just before the decision to 8,740 about half an hour after it, which is a rise of just 56 points. But once the news had been digested, the Dow Jones closed up 360.4 points, or 4.2% at 8,924.9. "You've seen the dollar weaken because it was a larger than expected cut - the dollar is falling against all major currencies," said Matt Esteve at Tempus Consulting in Washington. 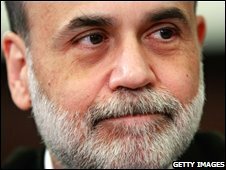 "On one side, we effectively have a zero interest rate in the US - on the other side, the Fed has sent a sign that they are ready to use all tools to help the US economy out of recession." Earlier in the day, official data confirmed that the threat of inflation is receding, as consumer prices fell a record 1.7% in November. President-elect Barack Obama said in a speech on Tuesday that his administration would also be doing its bit to stimulate the economy because the central bank could no longer use its main tool. "We are running out of the traditional ammunition that is used in a recession, which is to lower interest rates," he said. "That's why the economic recovery plan is so absolutely critical." He has undertaken to create at least 2.5 million jobs by 2011 as well as launching a programme of improvements to the country's infrastructure.